Free pickup and delivery for professional Rug Cleaning in Oakville. Professional Rug Cleaning since 1983. Our rug cleaners come to your home in Oakville and give you accurate estimate of work needed on your rugs. We are expert to safely and effectively clean all type of rugs. Contact us to schedule a pickup for Rug Cleaning in Oakville. All type of Persian and Oriental Rugs including Silk and Wool Rugs. I really like the rug cleaning service Joe provides. He is cheerful and efficient. I would not hesitate to use him and his company again when I need it. Patricia Jones - Oakville. We care about our Area Rug Cleaning process and Persian & Oriental Rug washing. Your precious rugs are safe with us. 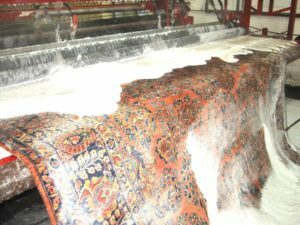 PersianRugServices is a family-owned, third generation Rug Cleaning company which provides free pickup and delivery for Rug Cleaning Oakville. We are certified Master Rug Cleaners serving Oakville, Mississauga, Burlington, GTA, and surrounding cities. When you bring your Rugs to us, you will receive the best quality rug care as well as 30% discount.